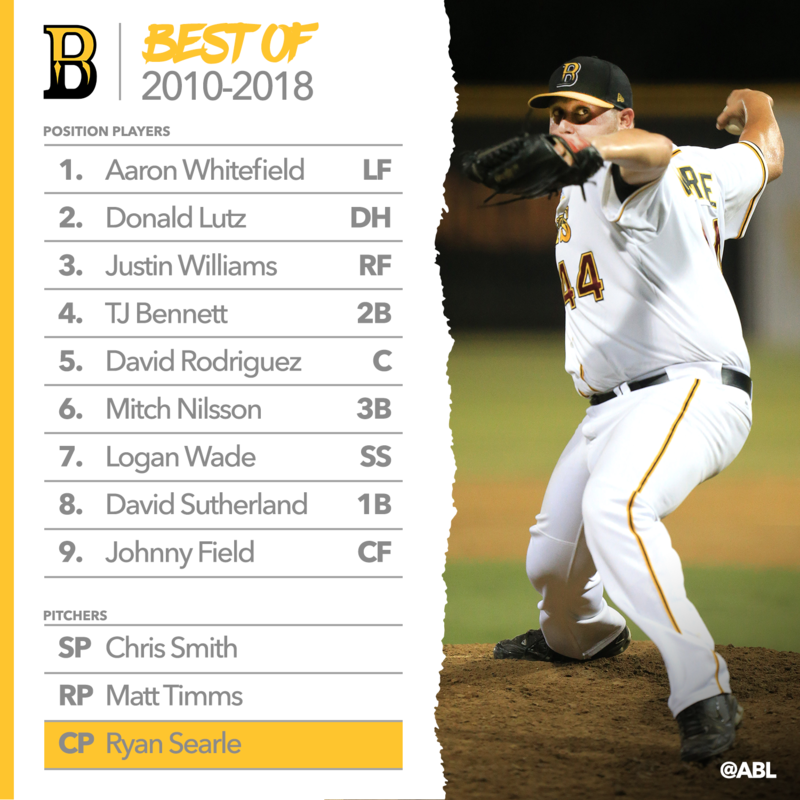 Who makes the Bandits' best ABL line-up? The team at theabl.com.au continues the unenviable task of selecting an all-time best team for each ABL franchise. After knocking off the Adelaide Bite before the Easter long weekend, our attention turns to three-time champions Brisbane. With a strong core of locals and number of quality imports, during and before the current title run, it was far from an easy task. But we have narrowed the talent pool down, completing a line-up card with nine hitters and starting, relief and closing pitcher. Selection is based on what players achieved during their time in the ABL and there are no restrictions on imports. To level the playing field between long term players and one-year imports, we have given more weight to players' best single-season output. The 2016/2017 Australian Baseball League MVP has been a standout during Brisbane's run of three-straight Claxton Shields. He is a career .318 hitter in the ABL, reaching a high of .338 in his MVP season when he ranked behind only Adelaide's Mitch Dening. His speed has been a major weapon at the top of the Bandits' order and his 20 stolen bases two seasons ago were a franchise record. Lutz tied the ABL single-season home run record as the Bandits wrapped up a three-peat of crowns last season. All up, Lutz has hit 25 homers in 82 ABL games with Brisbane and holds a batting average of .287 in three seasons with the club. His slugging percentage of .736 last season ranked second in the ABL. 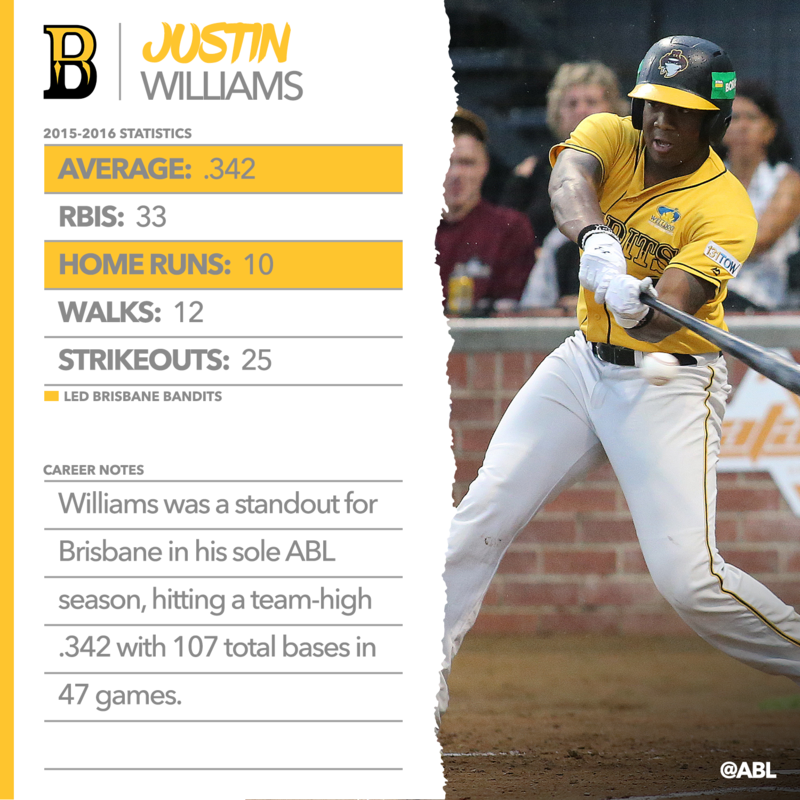 Williams led Brisbane with a .342 in his sole ABL season. It ranked him third in the league, while his 10 home runs placed second across the ABL. Williams finished with 12 doubles and a triple, racking up 107 total bases in a dominant campaign. Rodriguez made a late arrival in Brisbane during the 2016/2017 season but when he landed, he made every game count. The catcher recorded a hit in all 24 games - 19 in the regular season and five during the playoffs - he played in Australia. In 19 regular-season games he finished with an astonishing .442 average. Bennett joined Lutz - and Melbourne's Kellin Deglan - as the only players in the modern ABL to hit 16 homers in a season. All up he has 25 in 70 games for the Bandits and is a .318 career hitter in the ABL. Nilsson debuted for Brisbane in the inaugural ABL season but made limited appearances until a breakout campaign in 2015/16. He hit .284 with 39 RBIs and 12 months later hit .317 with 24 in 34 games. Last season he missed 15 games but still managed to drive in 27 runs and hit .341. Another long-time Bandit with three championship rings, Wade has featured in 232 games across six seaons in the ABL. An all-time .269 hitter, Wade's best season was arguably the most recent. He drove in a career-high 33 runs, averaging .282 with eight home runs. He also provided a number of dazzling defensive plays at shortstop as Brisbane captured a three-peat of crowns. Sutherland is impossible to overlook at first base for the Bandits. The first player to reach 200 hits in the ABL, the first Brisbane player to 300 games, and on top of that a career season in 2017/2018. The 32-year-old hit a mammoth .356 with a career-high eight homers. Sutherland has topped the 20-RBI mark in all three of the Bandits' championship winning years. Field put up strong numbers in his sole season at Brisbane in 2014/2015, hitting .291 with six home runs and 19 RBIs. He also stole 14 bases and produced some eye-catching defensive plays in the outfield. Smith's stint in the ABL, during the 2012/2013, may not be front of mind with the number of strong arms filtering through Brisbane since. But his numbers, and his stuff, were as good as any. In a Bandits team which missed the playoffs with 23 wins in a 45-game season, Smith was a standout. He led Brisbane with 65 strikeouts and a 2.31 ERA, which ranked second in the league behind only Sydney's Craig Anderson. Smith worked two complete game shutouts and allowed just one earned run in 28 innings at Brisbane's then home at the Showgrounds. Timms holds a 3.74 career ERA in the ABL and has consistently been a go-to guy out of the bullpen. In 2017/2018 Timms recorded a more than tidy ERA of 2.89 in 19 relief appearances. He recorded 31 strikeouts and a 1.18 WHIP. The modern day ABL saves record holder would be impossible to overlook. After making a switch from starter to closer, Searle has notched 36 saves from 39 opportunities. Including 17 in 2015/2016 as the Bandits claimed their first title. 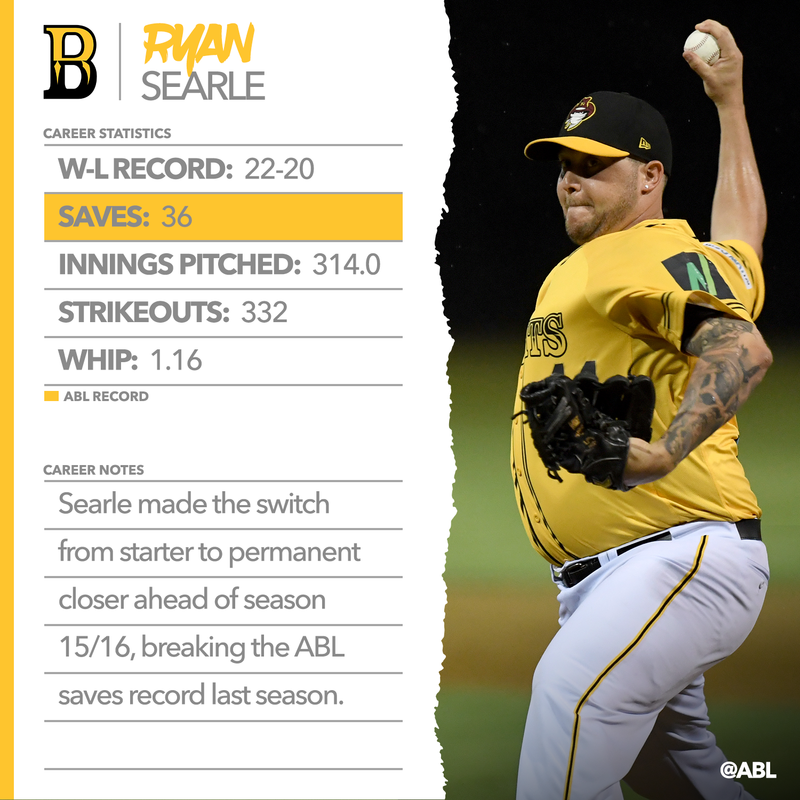 All up Searle holds an ERA of 3.15 in the ABL and has 332 career striekouts. How did we go? Who would you have in your best Brisbane Bandits team? Comment below! Stay tuned for the Best of Canberra Cavalry next Friday.